The cocky guys from "X Factor" who make up the band Emblem3 were partying their faces off in Los Angeles last week ... so much so that the hotel they're staying in threatened to kick them out. 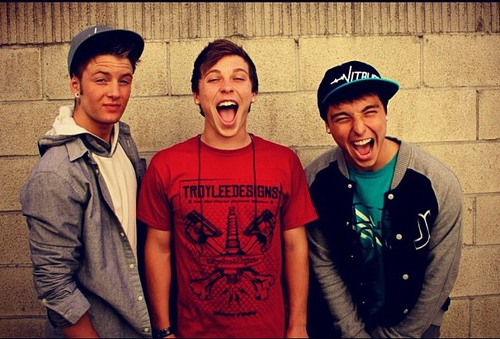 Emblem3 -- who made their name on "X" singing original songs -- is made up of three guys, ages 15 to 19. We're told the boys threw a massive party in their hotel room this week partying, which included other "X" finalists. According to our sources, it got so loud that hotel guests complained and called security ... who then shut down the party, and threatened to kick the boys out. We're told "X" producers -- who are footing the bill for all the contestants -- had to swoop in and save the day, by begging the hotel to let them stay. A source close to the show tells us, "All the partying Emblem3 is doing is distracting the other contestants and they've been warned to behave." Teenagers. What are ya gonna do?